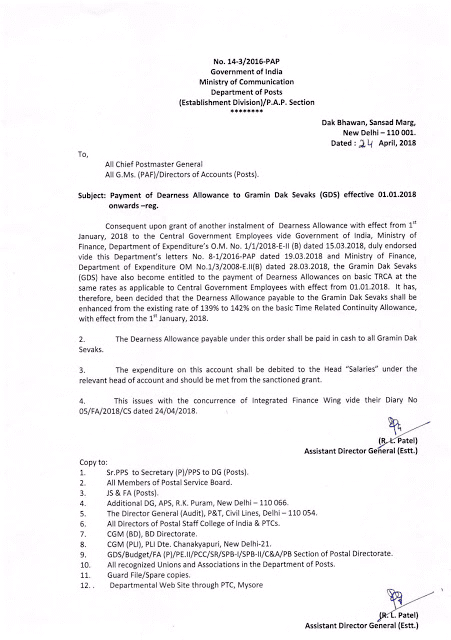 Subject: Payment of Dearness Allowance to Gramin Dak Sevaks (GDS) effective 01.01.2018 onwards -reg. Consequent upon grant of another instalment of Dearness Allowance with effect from 1st January,2018 to the Central Government Employees vide Government of India, Ministry of Finance, Department of Expenditure's O.M. No. 1/1/2OL8-E-II (B) dated 15.03.2018, duly endorsed vide this Department's letters No. 8-1/2016-PAP dated 19.03.2018 and Ministry of Finance, Department of Expenditure OM No.1/3/2008-E.ll(B) dated 28.03.2018, the Gramin Dak Sevaks (GDS) have also become entitled to the payment of Dearness Allowances on basic TRCA at the same rates as applicable to Central Government Employees with effect from 01.01.2018. It has, therefore, been decided that the Dearness Allowance payable to the Gramin Dak Sevaks shall be enhanced from the existing rate of 139% to 142% on the basic Time Related Continuity Allowance, with effect from the 1 st January, 2018. 4. This issues with the concurrence of Integrated Finance Wing vide their Diary No 05 /A/2018/CS dated 24.04.2018. Dearness Allowance payable to the Gramin Dak Sevaks shall be enhanced from the existing rate of 139% to 142% on the basic Time Related Continuity Allowance, with effect from the 1 st January, 2018.